Stockholm, Sweden is one of the most beautiful cities I've ever seen in Europe. From the waterscape views to the medieval cobblestone streets, it's a sure sight for the eyes. Think: quiet, windy roads, picturesque parks, steeplechase buildings, boats, cozy cafes and beautiful, clean parks! 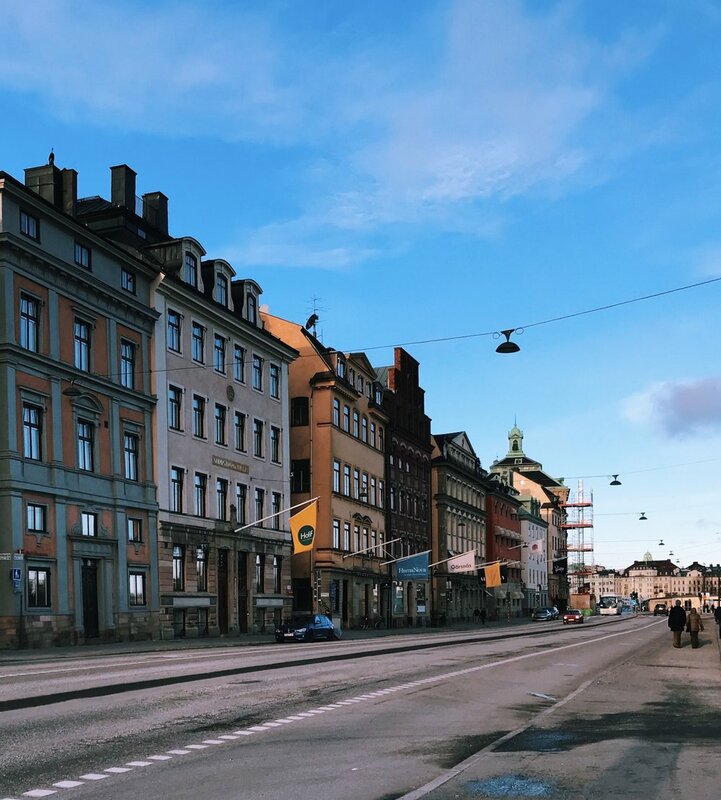 Stockholm is known for their keen sense of minimalism, fashion, design, and some bada$$ businesses that we are familiar with such as Spotify, Skype, Ericsson, and IKEA. Their cafe culture is unmatchable to any other city I've ever traveled to, so without a doubt below you will find plenty of delicious little healthyish cafes to check out. But first, some culture for ya! The public transportation is really easy to navigate. I found it super easy to get around both by bus and by subway. I also felt safe while traveling solo during the day. Download the "SL" app from the Apple App Store, buy a day pass and you can use it for up to 75 minutes. The app also has a navigation page so you can type in your current location and where you want to go to find the quickest, easiest, and most efficient route! Also, dont be afraid to ask the public transportation staff for questions! Just make sure they are authorized and properly uniformed before asking. And always keep your wits about you while using public transportation, in any city! I loved my time in Stockholm (I've been in both late summer and winter) but did find the dark winter a little hard to deal with. I come from the land of sunshine so this shouldn't come as a surprise. But I'd recommend going in the spring or summer months where more people are outside and Stockholm is blessed with light pretty much all day long! How cool is that? Another thing: as a Los Angeleno, I'm also used to saying hi and acknowledging runners when they run by, and fellow hikers as we weave through the trails. In my observation, that doesn't happen very much in Stockholm 😂 Just a bit different from here in LA! This was just my observation, not a fact. One thing I LOVED about Swedish culture is their philosophy of Lagom. Not too much, not too little. My mom actually got this book for me for Christmas, so I read it on the plane. It goes into detail about Lagom and I highly recommend it if you are into Scandinavian living! This sentiment of balance really stuck with me because as an American, I am used to the go-go-go all the time. In Sweden, they really embrace the "in between," not going too fast or too slow. They also practice Lagom in all things: relationships, work, finances, friendships, food, and exercise. Something we in the US could probably learn a thing or two from! Undoubtedly, one of my favorite aspects of Swedish living is Fika. Fika is the art of taking a work break in the middle of the day, either with a friend or coworker, and grabbing a cup of coffee, tea, or other non-alcohol related beverage. Oftentimes, it is paired with food, like a croissant or kanelbullar (Swedish cinnamon bun...more on those later). For me, this tradition has translated into a cup of herbal tea and a fat ball in the afternoon. Just taking 5 or so minutes to sit and relax helps me be more present and productive when I get back to work. I definitely ate my fair share of sugary treats while in Sweden because I love to indulge in the local cuisine while I travel. And when I get home, I just hop back up on the bandwagon and pick up where I left off. Below is your guide to Stockholm including some of my favorite stores, cafes, museums, and parks. I hope you find it helpful! Pom & Flora (cafe, $$) - Great spot for healthy-ish breakfast and yummy coffee! I loved it here. Very cozy vibes and a really nice oat milk matcha. Think: avocado toasts on rye, banana split yogurt bowls, chia seed pudding, acai bowls, and an assortment of pastries! They also have gluten-free options. Head in early to skip the line and snag a table. Snickarbacken7 (cafe, $$) - Another favorite healthyish cafe in Stockholm, this spot is much bigger so there is usually ample room for groups. The food is amazing. It's a bit hard to find (it's kind of underground/in a dungeon) underneath a large city staircase. I got a salad (pictured below) and I thought it used really high quality, fresh ingredients. They also have oat milk matcha lattes which are delicious. Check out their store within the cafe for beautiful blankets, ceramic mugs, bamboo charcoal toothbrushes and local art. Paradiset (grocery store, $$$) - This is Stockholm's version of Whole Foods or Erewhon. They have the widest selection of healthy foods that I could find in Sweden. Gluten-free breads, granolas, coconut yogurt, oat milk, teas, lentil pastas, hummus. They also have a great clean beauty section! Vasa Museum (public museum, $) - This museum is seriously cool. Head here for an afternoon of history and culture and to get some knowledge dropped upon you. The Vasa museum holds the oldest ship to ever have been rescued - and it is seriously COOL. Even if you are not into ships, I think you'll find this boat extremely interesting! Gamla Stan (neighborhood, FREE) - Really cute stoney streets hosting a plethora of shops, cafes, and bakeries, this little neighborhood's street is a must see. 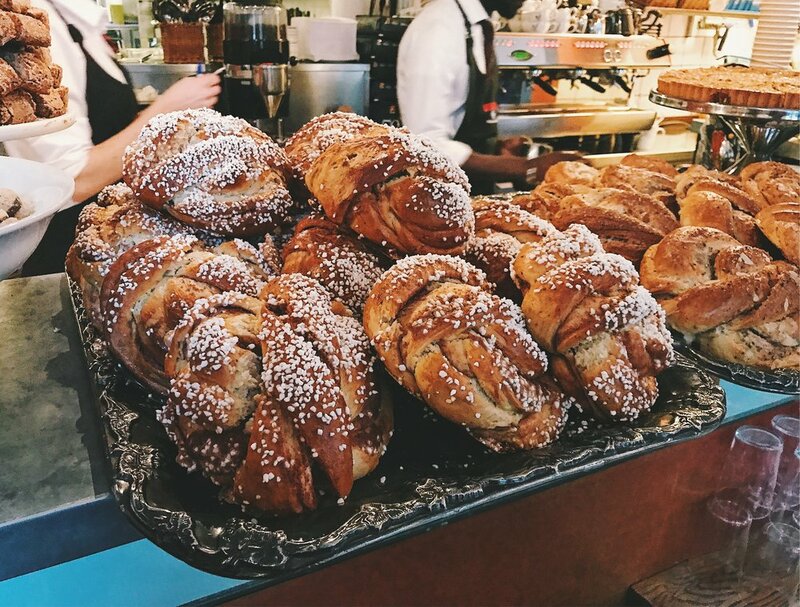 Petrus Bakery $$ - How could I do a review on Stockholm without mentioning kanelbullar!? The best kanelbullar I ever did have was here at Petrus. We went here almost weekly, and one time we went in the early afternoon, and they had just come out of the oven. We got a cinnamon bun and a cardamom bun, and we ate in silence because they were THAT good. I distinctly remember thinking, "Is this the meaning of life?" LOL, but seriously go on and get yourself a bun from here. Amida Kolgrill (restaurant, $) - Come here for some really tasty, high-quality Turkish food. You really get a bang for your buck here! The meat was some of the most flavorful I've ever tasted, and the vegetables were so fresh and pickled with love! I swear they spiced the meat with like 100 spices. And they use a real charcoal grill so you get that smokey flavor. Oh man, my mouth is watering writing this review. Anyways, I need to go get a napkin. But highly recommend it if you're into Turkish food. Saturn Cafe buns are the size of your face. Saturn Cafe $$ - Adorable little French and Swedish cafe/restaurant near the Park Humlegården. It's very sweet inside and they are famous for their larger-than-life cinnamon buns. But save your buns for Petrus Bakery, which I mentioned above. For me, I recommend trying their lentil coconut curry soup! Head to the park down the street afterwards for some fresh air. Falafelbaren (restaurant, $) - Amazing falafel joint that serves fresh falafel and kombucha (kind of hard to find in Stockholm) in one of my favorite neighborhoods of Södermalm. Their falafel plate with hummus and the works is amazing. Highly recommend it! Mariatorget Park (public space, free) - Nestled in Soldermalm (my favorite hood in Stockholm), this is a gorgeous park for people watching and noshing on a kanelbullar while taking in all the sights and sounds of Sweden. Gorgeous in the spring, summer, and fall, though quite empty in the wintertime. So, there you have it! The LFA guide to Stockholm. I hope you enjoyed, and find it helpful! Please leave your tips/favorite spots for Stockholm below in the comments, I'd LOVE to hear from you!